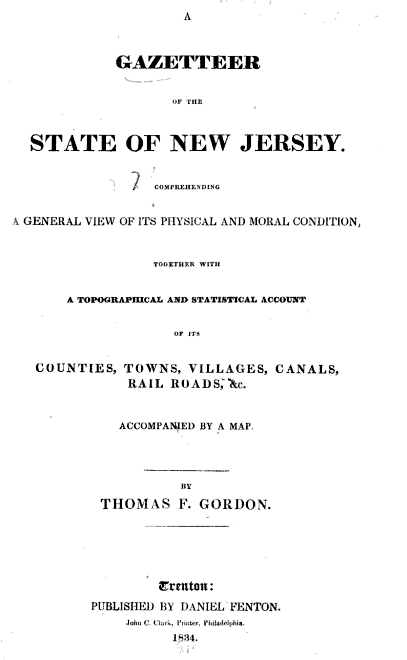 Thomas Gordon, A Gazetteer of the State of New Jersey: Comprehending a General View of Its Physical and Moral Condition, Together with a Topographical and Statistical Account of Its Counties, Towns, Villages, Canals, Rail Roads, &c., Accompanied by a Map (Trenton, 1834). 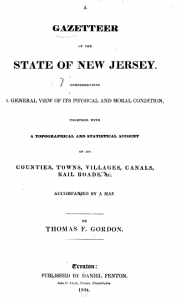 Who wants to know what the moral condition of New Jersey was in 1834? Also, I applaud Gordon’s brevity, given the average length of nineteenth century gazetteer titles.